Why Use Data Backed AI Ad Targeting and Customer Segmentation? It's a vast landscape out there for you to seek a path to effectively spend your ad dollars online. Picking the right path will allow you to achieve your goals like my friends were doing on their Utah adventure (Image courtesy Darian Westrick). Can Artificial Intelligence (AI) tools help you better target and spend your ad dollars to significantly increase your return? There's a lot to think about regarding new technology that has AI and machine learning built into them to improve your sales and marketing. 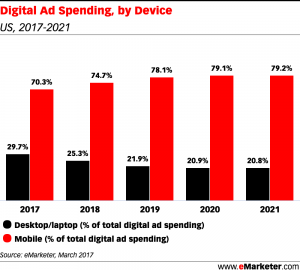 The fact is the use of AI to target, place, optimize spend, and enhance ad content are four of the top six current and projected uses of AI for digital advertising. Although you may not be totally comfortable with exactly how and what it does, you should not turn a blind eye to the possibilities AI presents and fail to adapt because your competitors are using it. Let's quickly clear up terminology. Artificial Intelligence: The science behind making a computer do something that would normally require human intelligence. Machine Learning: Making machines smart by feeding them loads of data and letting them learn over time through experience. An example of this would be Netflix. The more movies and shows you watch and rate, the better Netflix’s algorithm can deliver personalized recommendations. Deep Learning: Similar to the human mind, scientists refer to this type of AI as the “neural network” of machine learning. With this, machines can discover complex patterns by using layers of correlations. There is more and more data available to us to use in making better decisions. However even the most talented humans on your team are finding it harder and harder to scan, analyze, and discover insights in meaningful ways. We need machines to help and that help is readily available with technology using AI and machine learning. 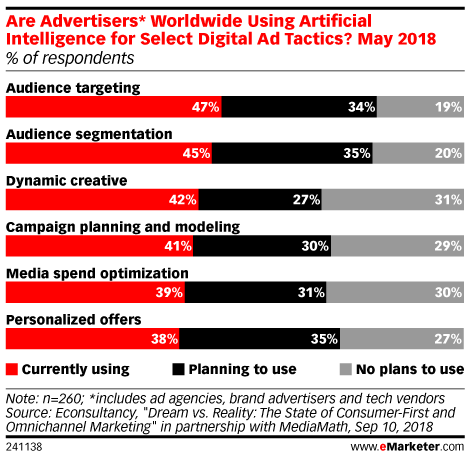 In a May 2018 survey of 400 digital advertising professionals worldwide conducted by Econsultancy and MediaMath found that two of the most popular ways marketers are applying AI is for ad targeting and audience segmentation. You are already aware of programmatic advertising through your efforts to use search engine marketing on channels like Google AdWords, Facebook or Twitter. At its most fundamental, programmatic advertising is simply the automated process of buying and selling ad inventory through an exchange. It’s all about real-time bidding for inventory across mobile, display, video, social, and televisions. The best tools to assist you in getting better ad spend are based on AI-enabled insights. "When AI is applied to programmatic advertising, it can do impressive things, such as navigate on its own within the environment, as well as provide you (and itself) with granular insights that make the economic path that connects advertisers and publishers clearly and significantly more visible, useful and profitable. And intelligent algorithms are continually learning; they’re fully capable of modifying or customizing their actions via their learned ‘experience,’ so your initial investment is quickly made back, and you receive the benefits of a gift that keeps on giving." Algorithms can analyze a site visitors behavior to serve up personalized ad content in the moment. That information is likely being gathered and used to inform future optimizations and ad content creation, as well. Demand and supply-side platforms (DSPs and SSPs) and data management platforms (DMPs) collect all kinds of first and third-party data, to inform decisions on personalization and ad purchasing. 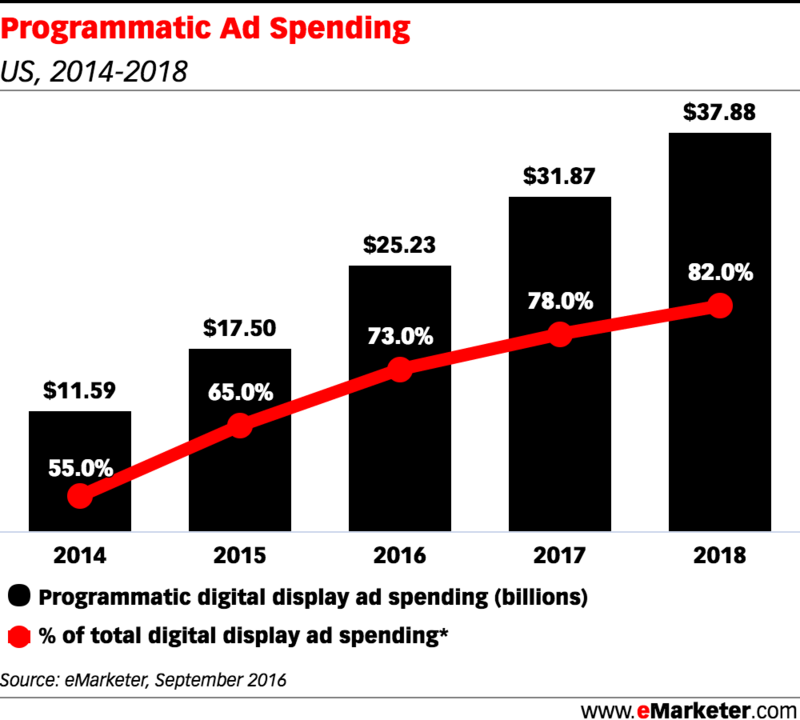 Programmatic can serve as an even more targeted and focused way to reach consumers with more relevant messaging, thus encouraging more attention to advertising. This type of automated learning and execution helps companies like SRAX focus more intensely on outcomes and on helping their clients achieve greater ROI through personalizations driven by ever-increasingly personal data. Through AI, psychographics will pick up where demographics leaves off, to give greater insight into the motives, needs, and purchasing behaviors that drive consumers in their decision-making moments. Speaking of SRAX, we have been successfully using a series of tools offered by them (@srax_digital and @sraxdigital) to develop and deliver significantly improved results for clients. The platform’s capabilities include autonomous media buying, as well as AI-powered ad testing and optimization. The company's first product, GroupAd, is a brand loyalty platform that provides instant rewards and feedbacks for consumers. The backbone of loyalty shows brands who their influencers are so that they can utilize this information to further hence their marketing efforts. GroupAd as a consumer facing product is a suite of marketing applications. The second product released by the company is SRAX, a platform built to aggregate and optimize the disperse real-time bidding channel so that publishers could utilize this revenue channel more effectively. Early on it focused on the selling side of the Programmatic Advertising market and it built its capabilities and expertise on the buying side as well by developing state of the art algorithm and practices to optimize the bid and targeting relationship. Both Social Reality businesses complement each other. Brands' advertisement attains their social marketing campaigns through traditional media purchased through the buy side of the SRAX platform. GroupAd provides extensive audience data that brands can target for their ads through the SRAX platform. Ultimately SRAX and GroupAd merge toward Social Reality vision which is to both automate and make digital ads available, affordable and efficient for all brands' markets and businesses of any size. More use of AI to develop an understanding of what is going on in the marketplace and make recommendations to buyers on where, when and how to use paid amplification. For many brands, the biggest obstacle to adopting more AI products is integrating the technology into their everyday workflow. In a BrightEdge survey of 500 content, digital and search marketers worldwide conducted in February 2018, nearly a third of respondents said that applying AI in their current role was the strongest barrier to adoption. Our partnership with SRAX is an example of what we do as a digital marketing and e-Commerce agency in developing good partnerships with "best of breed" technology companies to help outdoor brand companies improve the performance of their content and deliver customers who engage and purchase. 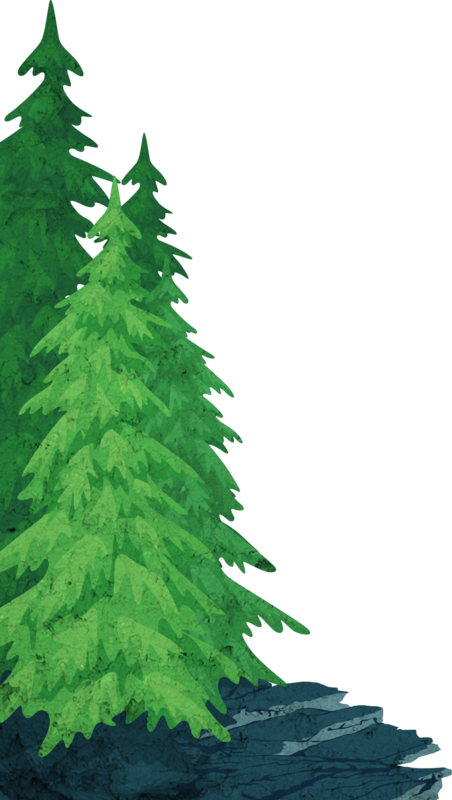 It's also critical in establishing a good partnership with the outdoor brand companies we work with to get the most out their digital marketing spend. SRAX takes a holistic approach to executing in this space. 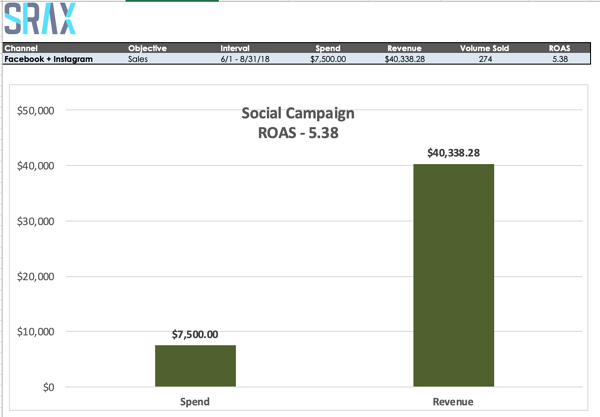 Humans develop the campaign objectives, the original content, and ad spend. Instead of taking each task and executing it as an individual one, this AI driven tool initiates, monitors, modifies, and adjusts in an ongoing, integrated, and continuous manner. It includes multi-variant testing and optimization, targeting, segment development, media buying, analysis, and recommendations. Does it work? We believe it does. Recently we ran a program for one of our clients, ALPS Brands. We worked with the client to set the goals and the channels in which to execute the strategy. For this effort, we used the SRAX tool to target the channels of programmatic desktop and mobile display for FaceBook and Instagram their email. Besides our own example, here is another one from a recent article published by the Artificial Marketing Intelligence Institute. An Australian company, RedBalloon, They started out shooting for a 500% return on ad spend and now average a 1,100% return. The founder (Naomi Simson) of RedBalloon, noted, “Your team doesn’t have to be scared they’re going to lose their jobs, instead, it’s more like they get an upgrade. At RedBalloon, people who were previously responsible for executing paid advertising campaigns now oversee Albert and make strategic decisions. Albert does the grunt work far better than humans, freeing up the team to invest time and resources into more valuable tasks." How has programmatic advertising provided benefits to brands in general? 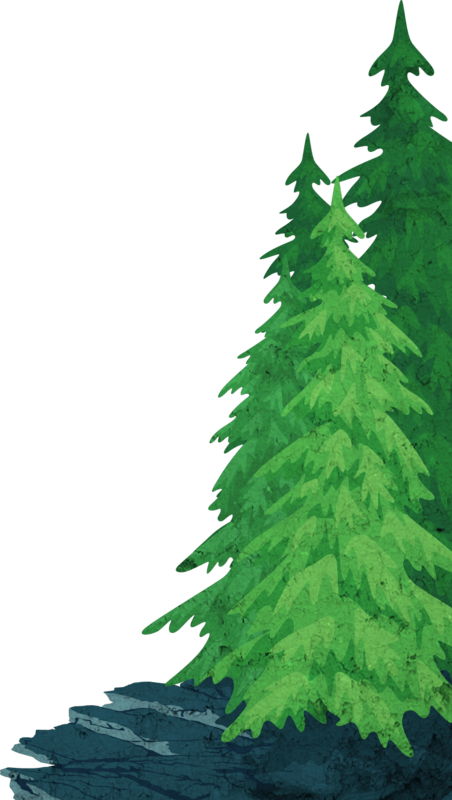 For example, here is one from Shopify that is an outdoor brand. VentureBeat’s recent machine learning article highlights some of the craziest wins advertisers have had since letting machines take over their ad spending. Volkswagen found that using AI for its ad buys in Germany resulted in better performance than even its agency could provide. Whenever Volkswagen uses the recommendations from Blackwood Seven, a Danish media agency that uses AI and predictive analytics to forecast ad spend decisions, it sells more cars than it would have if it had gone with its media agency’s recommendation, the head of marketing for Volkswagen’s passenger cars in Germany told Digiday. In some instances, the difference between the algorithm’s and its agency’s car orders have been as high as 20 percent. "Used correctly, AI could boost productivity by up to 40% by 2035 and increase your average profitability by 38%. Through the use of AI technologies, programmatic advertising will improve efficiency and make better budget decisions for you. The use of AI with programmatic advertising, segmentation and content improvement is now so fundamental it is unlikely we will ever see them operating separately again. 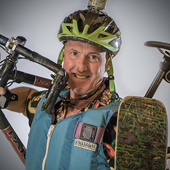 It can work for you as part of your digital sales strategies for the outdoor industry. You need to get the right tools in place using the right data and arming your team with the right training. These things don't happen overnight. AI might seem like magic once it works. But getting it working is just like any other serious software implementation. You need to commit for the long haul. You can begin testing tools and learning what’s possible even with just a basic understanding of the technology. Whether it's your team or partnering with an outside agency to leverage the tools and staff you have, this is a tool you should be using now. As for teams, look for hybrid marketers with equal parts agility, technological proficiency, and inherent accountability, who can think and perform strategically across multiple disciplines. The ideal marketing professional in an AI-charged environment is able to move seamlessly from the creativity of content and social to the science of optimization and analytics.